Does Your Program Have the Juice? 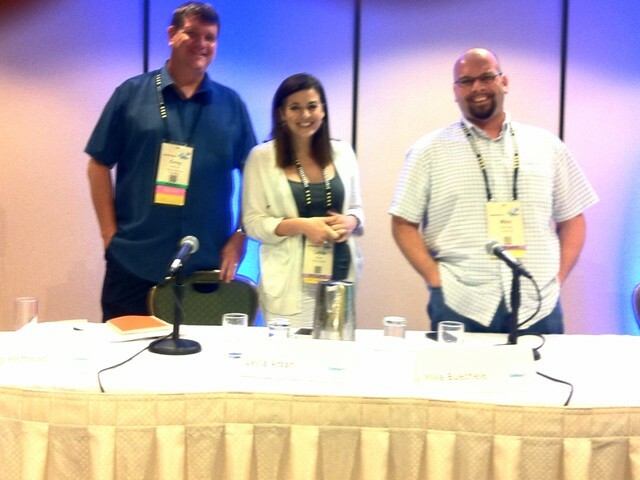 This was my third time at Affiliate Summit (#ASE12), but my first time speaking on a panel. I was nervous and excited... but I was mostly afraid that I would say something utterly stupid. Fortunately, I was in great company - I had Greg and Mike watching my back! FULL DISCLOSURE: I love Affiliate Summit! Since 2008, I've attended: Blogher, Blogworld, Blogwell, SXSWi, (most more than once) - along with dozens upon dozens of seminars, sessions, panels, classes, etc. I've even taught my own digital workshops. And, year after year, I get more useful, digestible information, that I can take with me and put into practice immediately from Affiliate Summit. Session dedicated to Brands / Advertisers / Merchants. Greg Hoffman moderated and affiliate managers for brands, also known as merchants, could volunteer to have their programs evaluated by the panel of affiliates - Mike and Leyla. The affiliates, gave their professional and personal assessment of each brand affiliate program. (Scroll down for more info on Greg, Mike & Leyla). Datafeed - does the merchant have one? How many items are in there feed? Cookies – how many days? Does the Merchant allow Auto Approval? Creative Banners available - how many and what types? Website - the look of the merchant website, does it look professional? Other details - is the merchant a Top 100 Merchant? How long have they been active? Do they have low funds? Greg (Moderator) noticed when searching for this merchant was that it was very easy to find this merchant in the ShareASale search due to the the various keywords the merchant had provided as a description. Top 100 Power Rank – we were pleased to find that this merchant's program was in the top 100 of over 3000 merchants in the ShareASale roster of merchants. They offer a datafeed – actually they offer four separate datafeeds for their varying product lines. Fruit baskets and other gift items. We opened the merchant page and Greg noticed the logo on the description page was modest in size, he applauded the affiliate manager for this. Someone asked this affiliate manager, "What do you look for when approving affiliates?" He had several different points that he looked for in an affiliate - Does the site have a disclosure page? What type of site is it? For him, a quality site with low traffic is OK if it has potential. Greg brought up seasonality, as it likely influences purchases on this site. The affiliate manager confirmed that Q4 was higher with the average commission being closer to $90-100. The affiliate manager’s name did not appear on the Merchant Description page, however, he confirmed that it is included in the approved / unapproved email. Instructional videos that demonstrate how to create DIY projects; topics vary from home & garden, to online sewing classes, arts & crafts, to cooking. Start-up based out of Denver, the program has only been live on ShareASale for a few weeks, the affiliate manager is new to the space and eager to learn how to present their products and grow their business. No Datafeed (this was a thumbs down, but the affiliate manager explained that she only learned what a datafeed was at the Summit on the previous day. Greg briefly explained to her how to go into ShareASale system, download the datafeed PDF and give it her programmers. Leyla and Mike emphasized the importance of having a datafeed. Average Sale is $10 and Average Commission is $3 (The panel thought this was OK. Not terrible, not great – if this product did well the affiliate’s audience, repeat customers could be a possibility. Company description (Written in HTML, good description with good content. But two things stuck out: 1) the logo was too large and it was missing the name and email address for the affiliate manager. We all explained that it was important to personalize and that “Team” or info@xyzcompany.com would not be sufficient. A woman questioned the importance of having a name / email of the affiliate manager in the description, she asked for the panel's rationale. Both affiliates on the panel expressed that they want to know who they’re working with, they want to know there is a person on the other end should they have a question or need. Leyla explained that she wants to feel like someone cares, “It makes me work harder when I feel like someone on the other end cares if I succeed or fail.” Mike expressed that he often times has technical issues or questions that need to be addressed, contact information helps him resolve these problems quickly. The affiliate manager asked what to do about people who apply to the program and have NO relation to their topic whatsoever and do not leave a description or explanation of which site they would promote the product on and how. Greg, the moderator, advised to provide a sentence in her “decline email" asking affiliates who feel they were unjustly rejected to contact the affiliate manager with an explanation / details why they should be approved. The affiliate manager also asked the affiliates, “Is there anything that you’ve seen in Terms and Services that you would not agree to?” Both replied, “Either NO PPC or Too Strict PPC Guidelines”. Craftsy was Juice-worthy. Small adjustments are needed, with some love and care, this could be a great program. The panel liked the affiliate manager, she was open to taking advice and eager to make her program a success. Science and educational products, such as telescopes, microscopes, and more. Prices went up to the $1000s. They had only been on the ShareASale network for two weeks. They were not present to represent their program. 7-day EPC was $517 – we were all a bit impressed by this until @SunShineTricia raised her hand and said, “If you’ll notice, their 30 day EPC is also $517, which means they’ve probably only made one sale in 30 days." An excellent point that the panel did not catch - look at both 7 day and 30 day EPC. They provided NO Terms of Service – Greg said that this was a terrible oversight and that all it would take is one bad affiliate to take advantage of this. NO JUICE. This program needs work and likely needs to outsource their affiliate program. Greg Hoffman (@akagorilla) is an affiliate manager with 7 years experience in the industry. He is creator and co-host of the Affiliate Juice Podcast and the Affiliate Voices Podcast. Greg is also the author of the affiliate marketing resource blog, Marketing Gorilla. Mike Buechele (@MikeBuechele) has been in the online advertising industry since the 1990s working with some of the biggest companies in adserving and digital marketing - including ADTECH and DoubleClick. Leyla Arsan (@Leyla_a) is a digital strategist at Zeno Group where she works with global brands developing content strategy and social media plan. She is also an affiliate who uses content marketing and community building to drive traffic. Great job on presenting at ASE Leyla, and great recap!